‘Life is movement. Change the quality of movement and you change the quality of life.’ Moshe Feldenkrais. 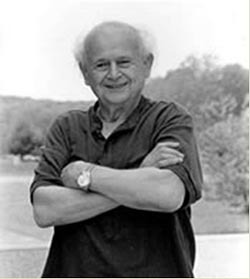 Moshe Feldenkrais was a distinguished scientist and engineer whose career included work at the Curie Institute in Paris in the 1930’s. He was also a respected Judo instructor, and was a founder of the Ju Jitsu Club in Paris. It was, however, in the relationship between bodily movement and our ways of thinking, feeling and learning that Feldenkrais achieved his greatest success. An injury to his knee in his youth threatened him with severe disability in middle age. Despite being given little hope of ever walking normally, Feldenkrais refused surgery and instead applied his extensive knowledge of anatomy, physiology, movement science and engineering, as well as his mastery of martial arts, to healing his own knee. During the process he realized the vital importance of working with the whole body and indeed the whole self in order to achieve lasting, radical change. Dr. Feldenkrais worked with all kinds of people with an enormous range of learning needs -from many infants with Cerebral Palsy to leading performers such as the violinist, the late Yehudi Menuhin. He taught over a number of years for the dramatist Peter Brook and his Theatre Bouffes du Nord. He was a collaborator with thinkers such as anthropologist Margaret Mead, neuroscientist Karl Pribram and explorers of the psychophysical Jean Houston and Robert Masters. His insights contributed to the development of the new area of somatic education, and continue to influence various fields such as, neurology, psychology, performing arts, sports and rehabilitation.